MSPIFF Documentary Competition Award Winner! In the Rust Belt, three young men grapple with oncoming adulthood and the differences between them. One of the men, filmmaker Bing Liu, captures thrilling footage of his friends Zack and Kiere while riding on his skateboard—a unique approach that brings us deeper into the trio’s world. The affable Zack learns that his girlfriend is pregnant and he must make the jump from boy to man. Kiere, still reeling from the death of his father, is looking for a job and considering his place as the youngest, and only African American, in the group. All three young men in Minding the Gap have suffered abuse in some form, but as Liu peels the curtain back on the lives of his friends, as well as his own, they are forced to confront the divisions that rest beneath their bond. 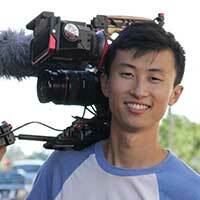 Bing Liu began his career making DIY skateboarding videos. At 19, he moved to Chicago and earned his B.A. at the University of Illinois, and would go on to work on a film projects as a member of the International Cinematographer’s Guild. Minding the Gap is his first feature-length film.